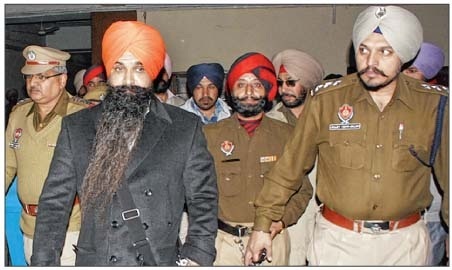 BAGHAPURANA, Punjab—Alleged Khalistan Liberation Force’s Chief Bhai Harminder Singh Mintu and recently arrested Bhai Ramandeep Singh were produced before the Court of Sub Divisional Judicial Magistrate Pushpinder Singh in Baghapurana on November 15. The duo accused was silently brought to the Court by the Police party of Inspector Jangjit Singh of Baghapurana and DSP Subeg Singh of Nihal Singh Wala. The Police pleaded the Court for extension of remand of the duo accused as other persons involved in the shootings were still to be identified. The Police also claimed that Ramandeep Singh had procured weapons from Meerut and his interrogation was needed to trace weapon providers. Although the Defence lawyer Advocate Jaspal Singh Manjhpur opposed the Police’s claims but the Judge Pushpinder Singh extended Bhai Ramandeep Singh’s police remand for three days and Bhai Harminder Singh Mintu’s for two days.